My love for monthly beauty subscription boxes is quite evident by now. So, here I am today, with another unboxing and review post and this time it's the My Envy Box May 2017 edition. 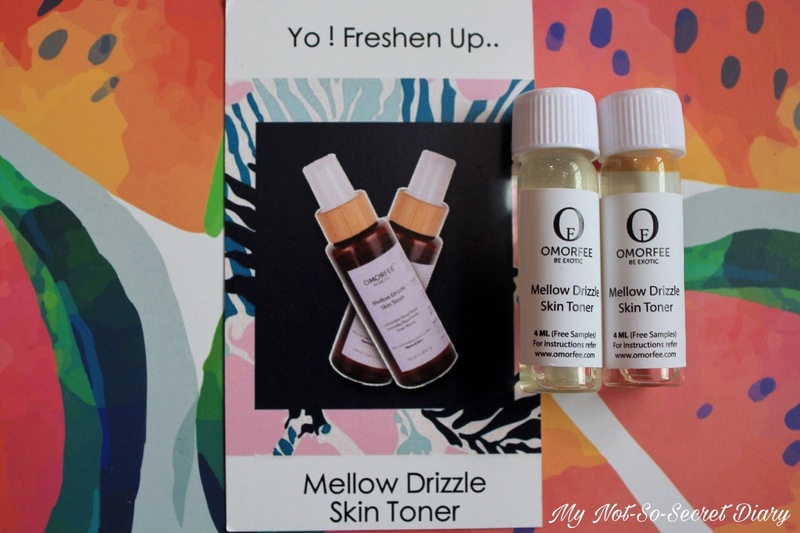 After receiving my first beauty box last month I was so happy with the products, I really wanted to try the upcoming boxes too. So when I found the May beauty box in my mail, I was on top of the world. I definitely love surprises like this. So let's see what is this months's box all about. So the theme of this month is Sip Of Summer. And true to it's the name, the box as well as the products inside it, give you all kinds of summer feels. 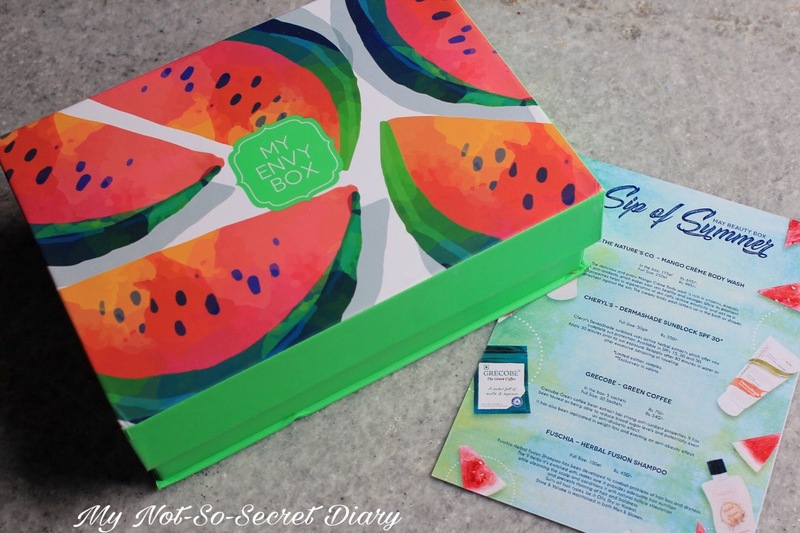 The box is in a light green colour with water melon print on it which looks like it has been painted with water colour. There are a total of 6 products and all of them are beauty products. Since summer is all about taking care of your skin and hair and makeup hardly stays when you have a long day outside, I think keeping all kinds of beauty products is a great idea. So, let's see the products now. 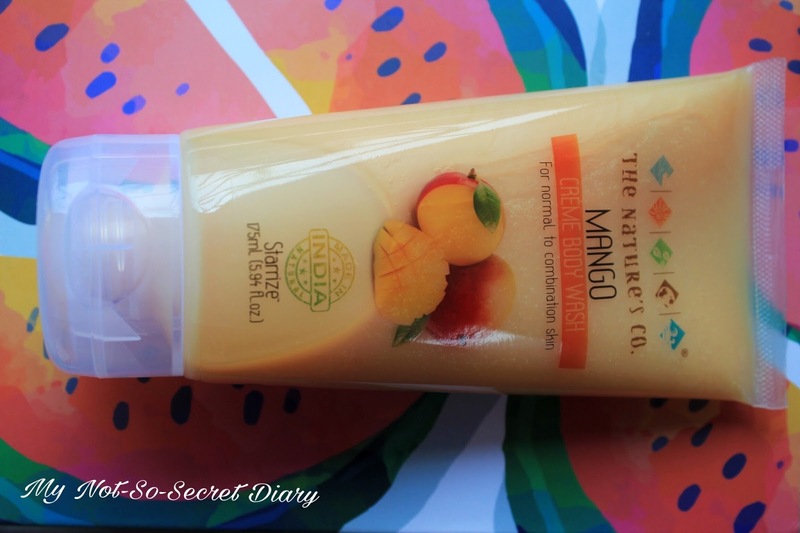 The delicious and pulpy mango crème body wash is rich in vitamins, minerals and anti-oxidants, which makes your skin healthy and younger. It helps in regenerating skin cells, maintain it's elasticity as well as protects your skin from sun. I am a big fan of body washes and shower gels. Even though I prefer shower gels for summer, I would any day use a body wash because even during summer, dehydration and drying of skin is common. And if you a regular reader you would very well know I have really dry skin. The body wash smells great. And since I am a mango lover, I can't wait to give it a try. It is a deluxe size product of 175ml and the price is Rs. 695/-. The price for full sized product of 250ml is Rs. 995/- . 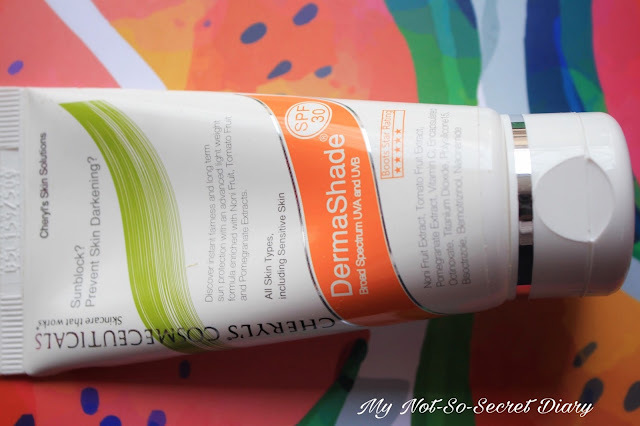 Cheryl's Dermashade Sunblock uses active herbal extracts which offers you a complete sun protection. Another summer essential is a sunblock. Well you should use a sunblock throughout the year but in summer I just can't think of a day without a sunblock. This smells just like any other sunblock out there in the market which is great. Even though I already have a lot of sun blocks I have never tried anything from this brand before so I am surely going to give this a try. It's a full size product of 50gms worth Rs. 550/- . Grebe green coffee has strong anti-oxidant properties. 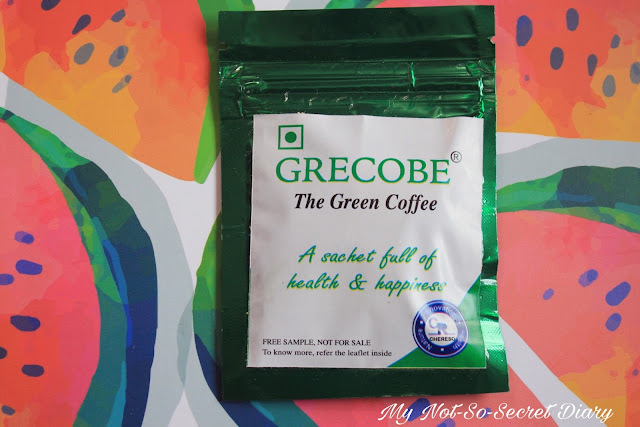 As the brand says, this has an anti-diabetic effect as it can reduce blood sugar level. Also it has an anti-obesity effect. I am not a coffee person anymore. It was hard to give up so I would not give this a try. But this sounds great so I would give this to a friend or a family member who would want to try this. In the box: 5 sachets - Rs. 70/- . Full size: 30 sachets - Rs. 540/-. Fuschia herbal shampoo has been developed to combat problems of hair loss and dryness. The 9 herbs it's enriched with, makes sure it provides adequate hair nutrition while cleansing the scalp and conditions it with natural follicle stimulation and prevents thinning of hair and baldness. 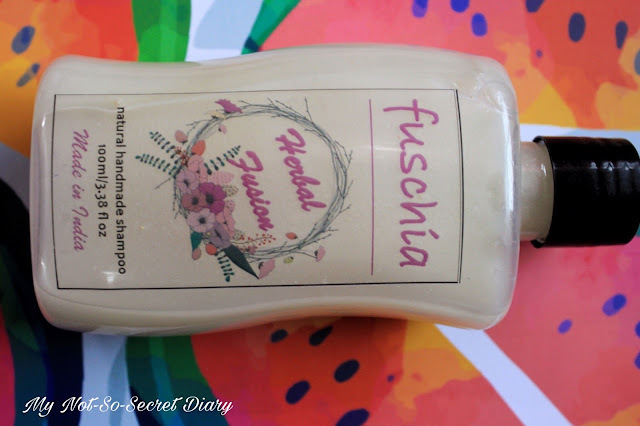 The thing I love the most about this shampoo is that it is a natural handmade shampoo. But I did not like the smell of the shampoo though. But if it works great then I don't have any problem with the smell. So I am excited to give this a try, also because this is my first handmade shampoo. It is a full size product of 100ml worth Rs. 450/-. 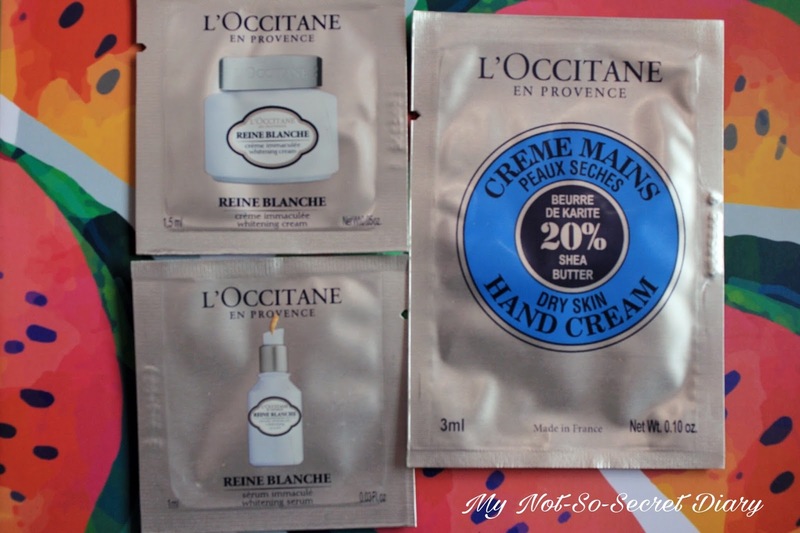 There are 3 sample size products from L'occitan. 1 sachet (3ml) of Shea Butter Hand Cream - Rs. 96/-. Full size: 30ml - Rs. 720/-. 2 sachets (1.5ml each) of Reine Blanche Illuminating Cream and Serum - Rs. 95/- each. Full size of the cream: 50ml - Rs. 4590/-. Full size of the serum: 30ml - Rs. 4590/-. All the three products are for one time use. The thing is you would never understand how a product like a serum or an illuminating cream works on you if you do not at least use them for a week. So I wish they had sent one product only but the quantity was more. This toner is enriched with lavender, sour honey and rose to toner and soothe your skin. I make sure I follow the cleanse, tone, moisturise routine everyday. So I am really very excited to include this in my routine and see how it works on my skin. In the box: 4ml vial (2 of them) - Rs 32/- each. Full size: 100ml - Rs 799/- . So, that's all I have got in my May Beauty Box. If you loved these products, you can get your own My Envy Box May 2017 edition at their official website (Click here). So, that's all. Do let me know if you want more such unboxing and review posts on my blog. 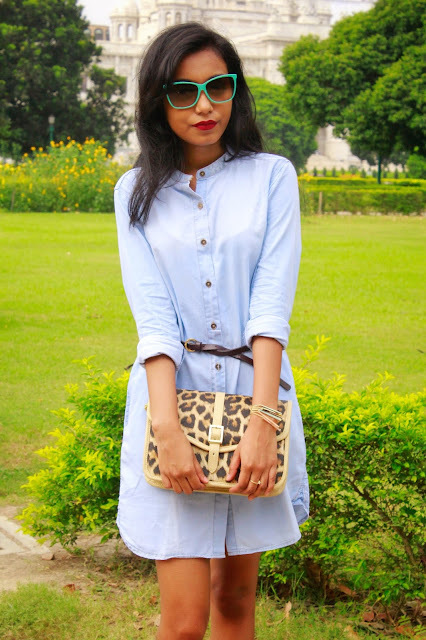 The one reason I love shirt dresses, specially denim shirt dresses so much is because of their versatility. You can style it in a number of ways. For instance, you can simply wear it as a dress or a top, both tucked in as well as tucked out, or as s shrug over a top or dress. So, for the second outfit in collaboration with Bewakoof.com, I picked up a simple denim shirt dress. 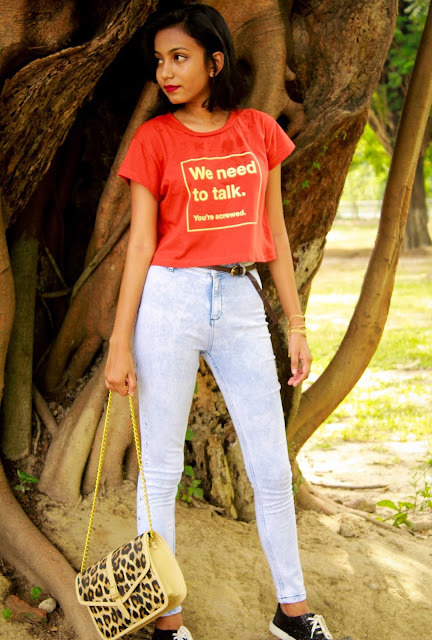 If you haven't read the first outfit post already, here's a quick link. 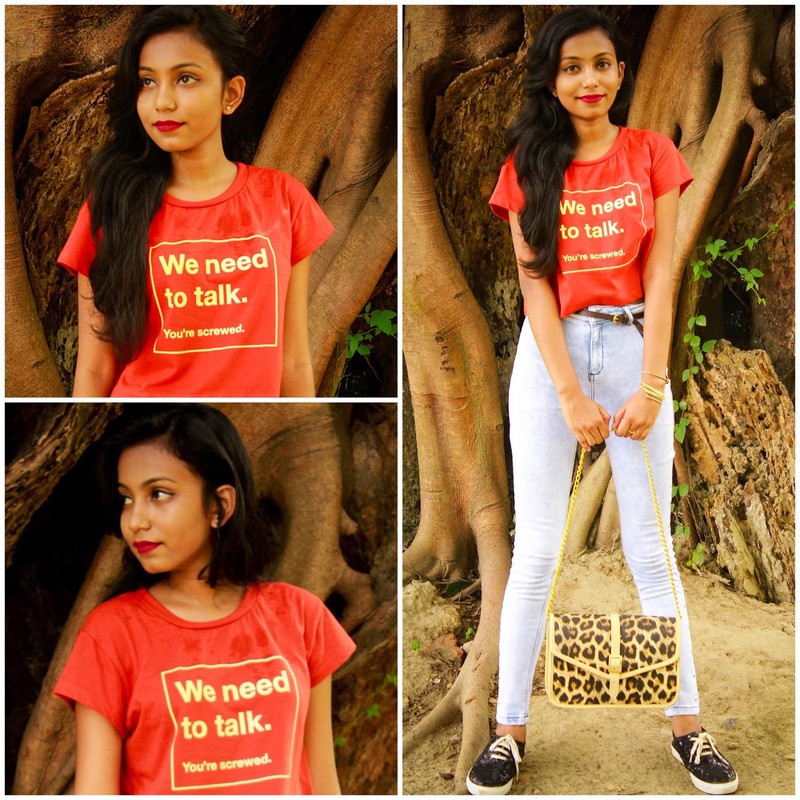 Even though Bewakoof.com provides the best kind of apparels for the casual, sporty person in you and this dress could be styled in that way too, I opted for a boho yet classy look. I folded the sleeves for a little distressed look. I put a belt around my waist to make the dress look more dressy and girly. For my shoes, I wore my favourite pair of gladiators. 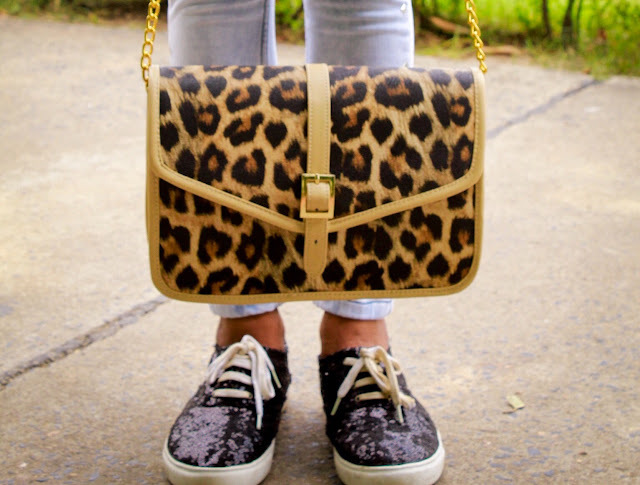 I carried the leopard print handbag with golden sling and finished the look with my a pair of wayfarers and golden bracelets. You can check out the collection of casual dresses here. I can guarantee you'll love them all. 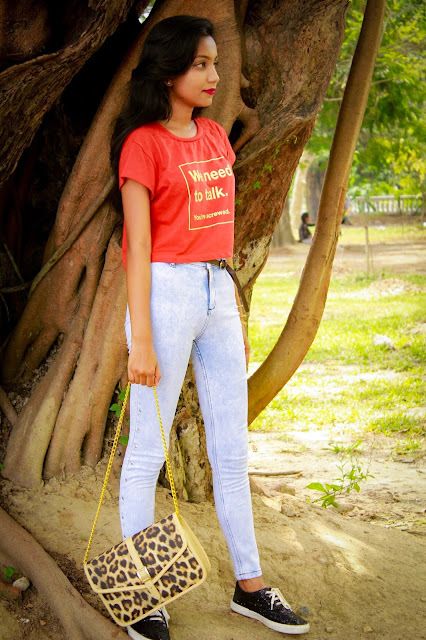 As I already said the previous post, you should definitely check out the track pants, jeans and tank tops for men, pyjama and the collection of XXXL T-shirts. They are amazing. When it's summer and you hate it clap your hands, *clap clap clap*. Well if you are not from a tropical country you might think I must be a crazy woman to hate summer but trust me there's nothing worse than hot and humid weather for months. 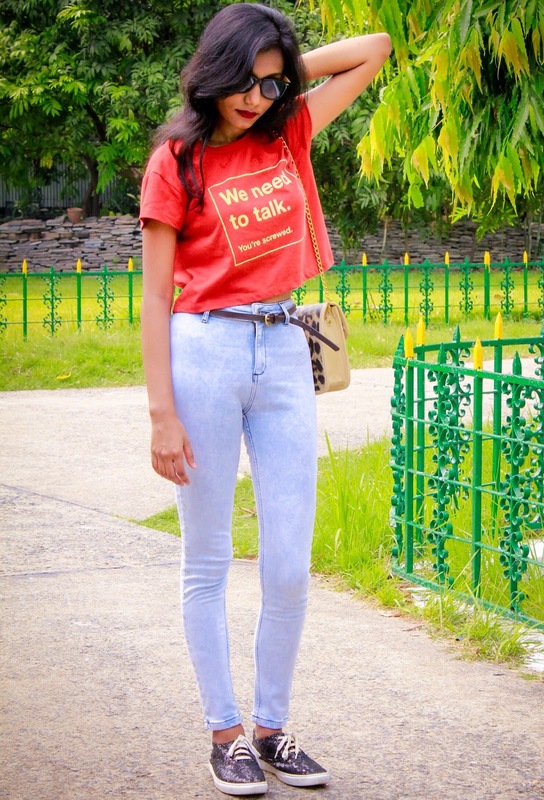 Being a fashion blogger in Kolkata is not easy. Leave fashion blogger, being a human who has work which requires that person to go out in the sun in Kolkata is not easy. Well I can go on with my rant because this is my favourite complaint and topic of discussion but I will just stop it here. So coming to the point, just because it's a volcano outside it shouldn't stop me from doing what I love the most, dressing up. And that's where casual style comes into play. I have not been much of a casual person. If you are a regular reader of my blog you can pretty well guess that. Even if I am wearing something casual I would add up something to make it edgy. But lately I am finding it quite interesting and of course it's comfy so now I am on my way to explore it more and more. 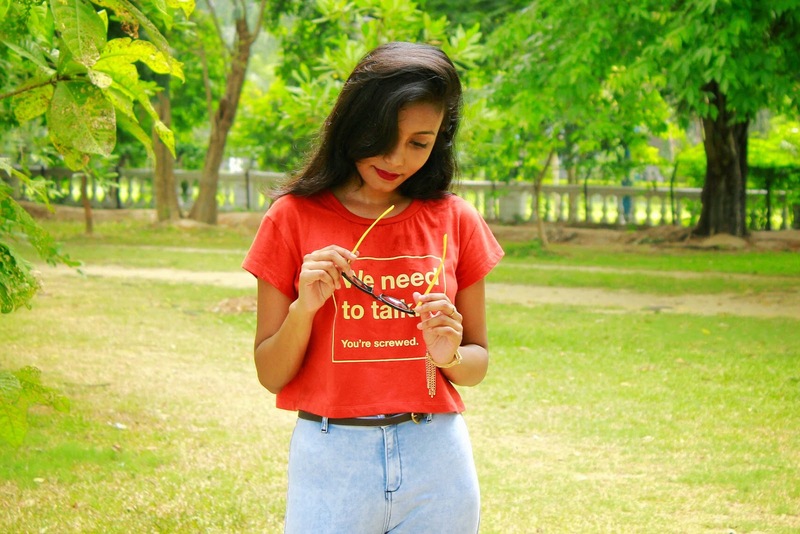 So, for this style post I have partnered with Bewakoof.com again and styled one of their quirky casual crop top. If you don't know it already then let me tell you bewakoof.com is the perfect place to look for casual comfy clothes with the right amount of edge and style at a very affordable price. 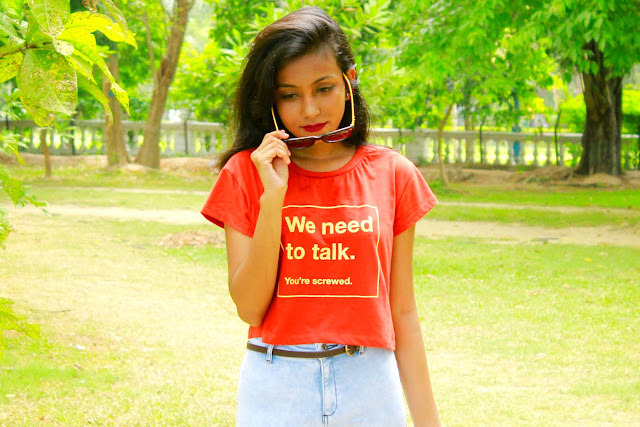 I picked up a red crop tee quoted with "We need to talk. You're screwed". I found it really cool and funny. 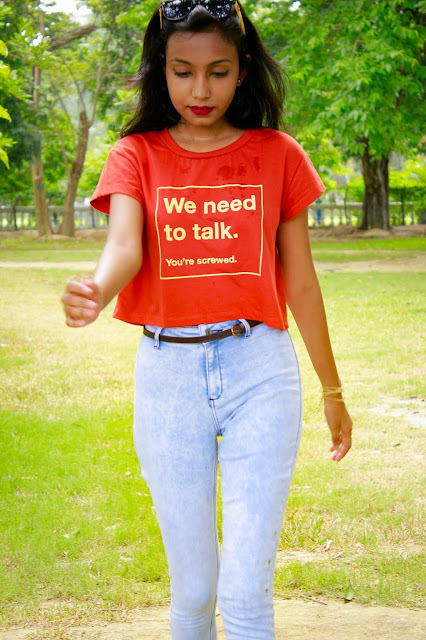 When we girls say that we need to talk it really means you are screwed because we have evidence to support every freaking thing you are going to hear and there's no way you are going to win the argument. Yes, that's women for you. One sentence, such big explanation. I love how a simple quote on a basic t-shirt can completely make it stand out. I paired it up with a comfy pair of faded jeans with small silver studs on both side. For my footwear, well you can guess it, it's my black sequinned sneakers. I don't know why I still can't get enough of these. 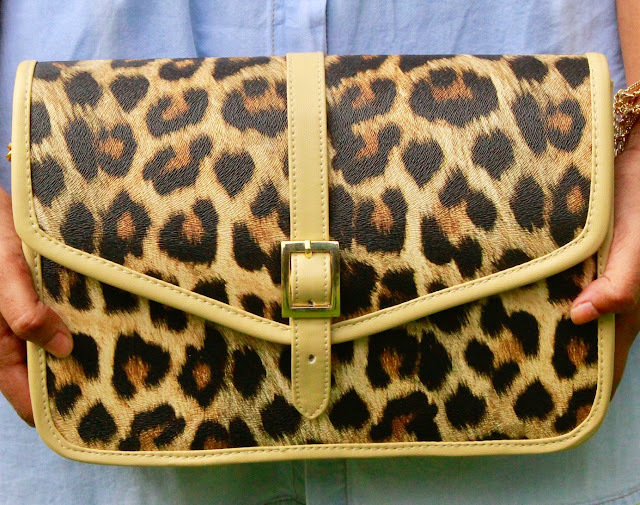 I carried a leopard print satchel and completed my look with golden bracelet and a pair of yellow sunnies. 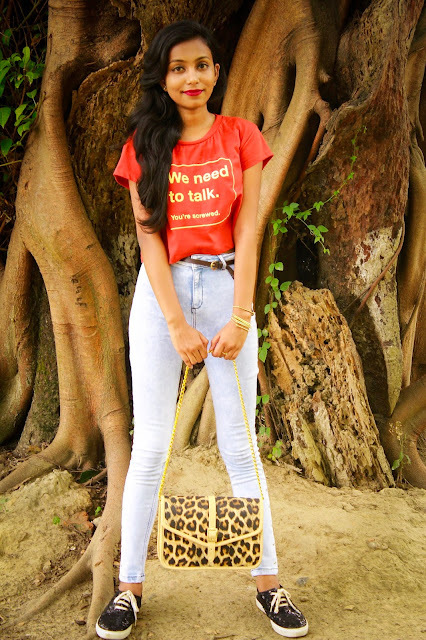 I don't know if it's just me but even though it's a really casual outfit, it somehow gives a strong independent woman vibe with the slogan on the tee, the black sneakers and the leopard print satchel. 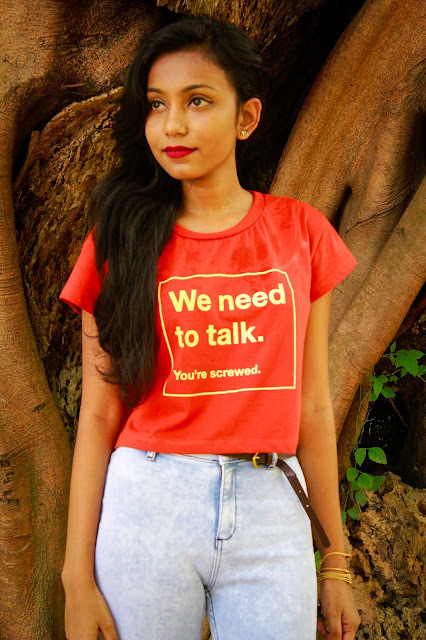 Also, I should mention I totally love the collection for men at bewakoof.com. You should definitely check out the track pants, jeans and tank tops for men, pyjama and the collection of XXXL T-shirts. So I hope you liked the post. I have another outfit post coming up soon on the blog so stay tuned. 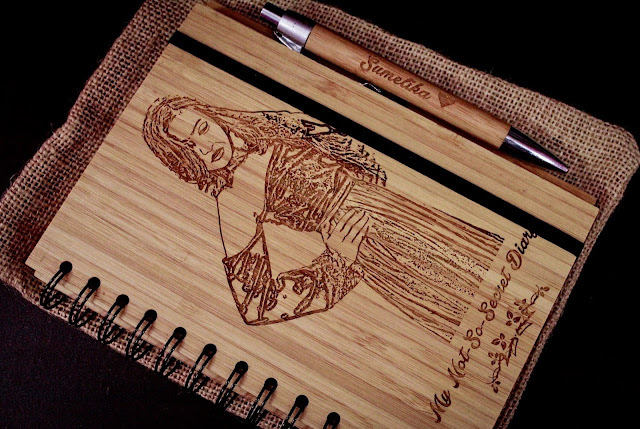 What if I told you you can engrave your favourite moments and memories on wood and carry it with you always in the form of a notebook or maybe a phone case. Yes it's possible and I am going to tell you how but before that let me tell you a small story or rather share with you something very personal. When people ask me how much blogging means to you, my answer is always more or less everything. I love traveling, dressing up, exploring make up and beauty products and writing and I can put all of that together here, in my blog. This is my happy place, you know, my unicorn island, the place that makes me feel happy and positive, the place that makes me feel strong, confident, independent and self-sufficient. If you have been in my journey from a very long time, you would probably know my story but if you are a new member in this family then let me tell you a little bit about it. My life was a mess and I was lost. I didn't know where I was going in my life or I was going somewhere at all. From my teenage years I was always in the habit of writing a diary. More than anything writing was therapeutic. Just like everyone, my teen life was entertaining and happening. I would write down every good bad thing that happened throughout the day before going to bed and magically all the stress would go away and I'll be all relaxed. Writing always calmed me down. So, I decided to take it one step further and not just write about things that I love, things that make me wonder, things that make me happy but also share it with others, and hence a blog. And for the name, well what better name could I choose for my blog. It was an extension of my diary, except it won't be a secret anymore. And from there I have come a long way and I did not realise when from being my passion, it had become a part time profession. I have worked with a lot of brands but today I am going to tell you guys about a brand that made me feel nostalgic about my blog. I am talking about WoodGeekStore. In an era of mass producing goods differentiated only by labels, WoodGeekStore stand out from the crowd with their creative way of using wood. You can now get your name, picture, logo engraved on wood, thanks to WoodGeekStore. 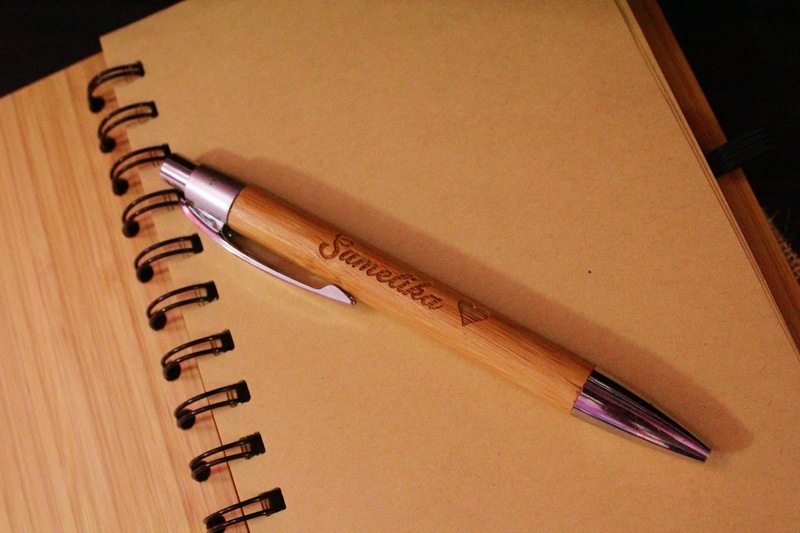 So given the fact how much I love diaries and what they mean to me, I was so touched when I was sent a customised wooden notebook with one of my favourite photos engraved on the cover along with my blog's name on it and what more I got a wooden pen along with it with my name and a heart on it. Among so many gifts I receive so often this is surely very special. I can now note down everything on my customised notebook be it work or something personal and what more, this will be the perfect companion while traveling where I can pen down my stories. 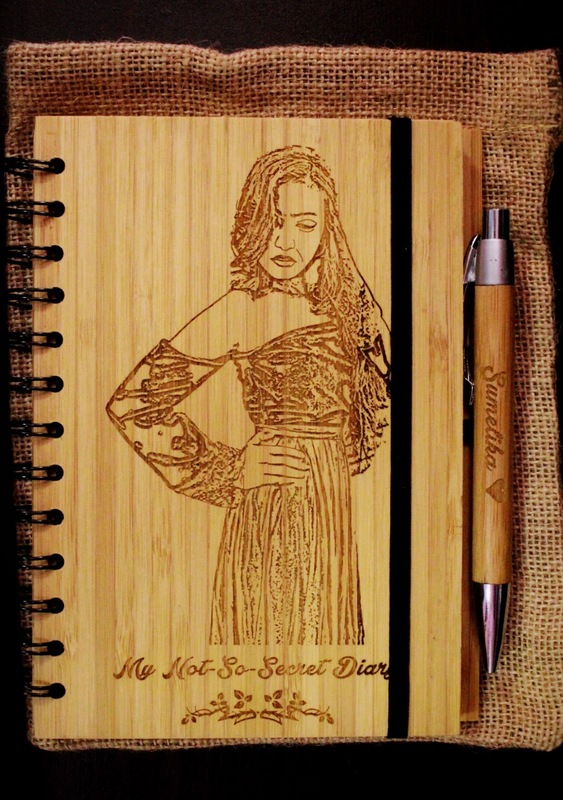 Even you can get your own customised notebook, Personalized Wooden Notebooks, Personalized Diary, Custom Fashion Journal, Customized wooden notebooks, Personalized notebooks, Eco-friendly bamboo notebooks. It's pretty simple. pick up the notebook, upload the picture you want engraved, put in the texts and place the order. There's no extra charge for customisation. They send you a mock design for you to confirm. The delivery was so quick I was pleasantly surprised. And not just custom made bamboo notebooks, WoodGeekStore also offers Customised wooden phone cases and wooden sunglasses with polaroid frames. I must say I am so impressed with such unique idea. And I can't wait to shop from WoodGeekStore again. This is also a great option for gifts. So go check out their collection. Being a person with really dry lips, thanks to my habit of not drinking enough water, I can't imagine my life without a moisturiser. And what more, I am a sucker for liquid lipsticks. So It's important for me to always take care of my lips and keep them hydrated. Even though I kind of stick with one chapstick which works great for me, it doesn't stop me from trying new products. So when My Island Kiss sent me their collection of Tropiqué Pomade Lip moisturisers, I was really excited to give them a try. 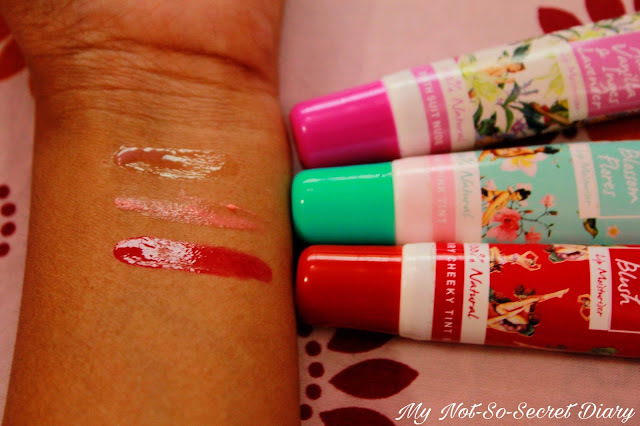 "Island Kiss is a Lip Care Brand inspired by Tropical Beaches across the world, fragrant coasts, salty air and lush notes of fruit and flower. Backed by Global Fund Solutions, Island kiss plans on a systematic product growth plan across the year 2016-2017. 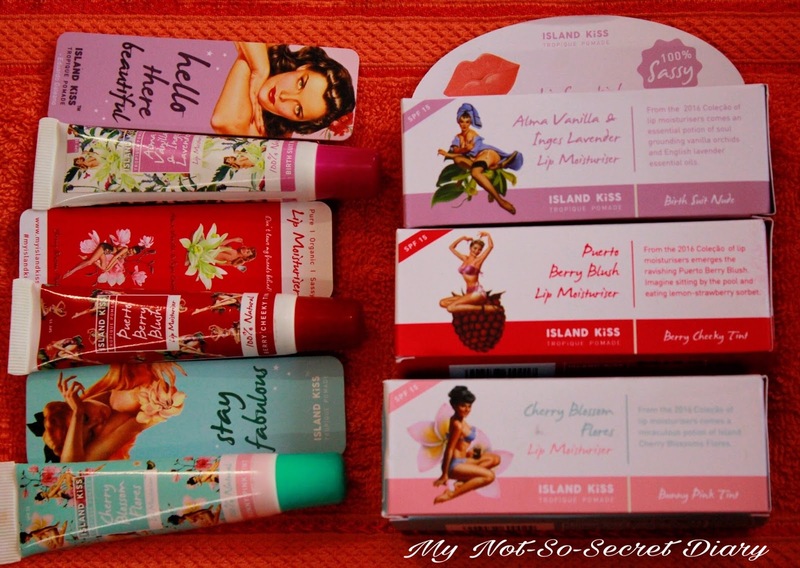 Island kiss intends to house a range of 20 products within the lip care category, across colours and flavours. To start this venture with an impactful bang, Island kiss intends to launch It's first High-End Product- the 'Tropical Lip Moisturiser,' or as they'd say in French- Tropique Pomades' in smashing flavours. At Island Kiss we are a little obsessed with fun, organic freshness—and natural decadence. The collection is crafted in artisan-size batches using essential oils, active plant botanicals, and rich exotic butters. Because it’s non-toxic and safe and edible." The packaging is definitely my favourite part of all the three products. It is so cool with the fancy pop art. I really loved how they put so much thought into it. 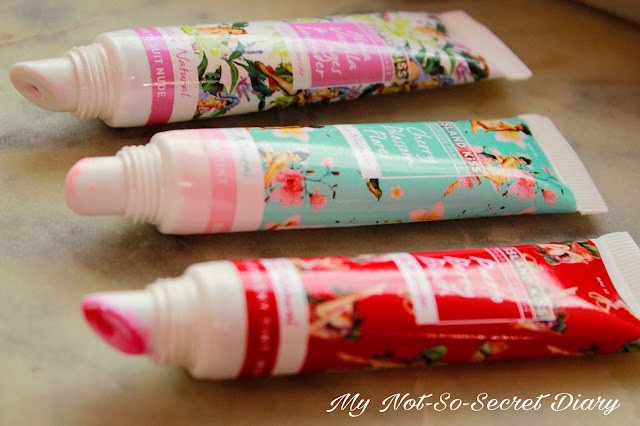 The lip moisturisers come in tubes with a screw cap closure. the applicator is slanted so you can easily apply it on the lips directly from the tube. Each tube is also printed with the pop art similar to the one on it's box. Ingredients, shade name and the direction to use is also mentioned in the tubes. 1. Alma Vanilla & Inges Lavender: It has a slight Lavender tint to it which appears clear on application. 2. Cherry Blossom Flores: It is more on the creamier side with a slight hint on pink which looks whitish on the lips. 3. Puerto Berry Blush: This is the prettiest one out of the three with deep raspberry pigmentation. Overall, if you like pigmented lip balms then you can only get it in the Puerto Berry Blush. These smell amazing. Each lip balm has a unique smell due to the various ingredients. 1. Alma Vanilla & Inges Lavender: It has a strong mixture of vanilla and lavender scent. 2. Cherry Blossom Flores: It has a sweet floral smell. 3. Puerto Berry Blush: It has a fruity smell. The texture is more or less same for all the three variants. Thin oily consistency which provides good lustre on the lips. However, I don't find the formula that hydrating. They are more or like glosses. The ingredients are all natural and good for skin. So in that case you can opt for them when you want glossy lips but don't want to use a gloss or want to keep your lips nourished at the same time. You cannot really use them under a matte liquid lipstick though. The staying power is really bad. It definitely transfers very easily. It's because of the three oils present in them which makes it very transferable. Overall I think it's a great option for summer if you have normal or slightly dry lips. Since I have really dry lips it kind of doesn't work for me. Also, for the winter months it's not a great option too. 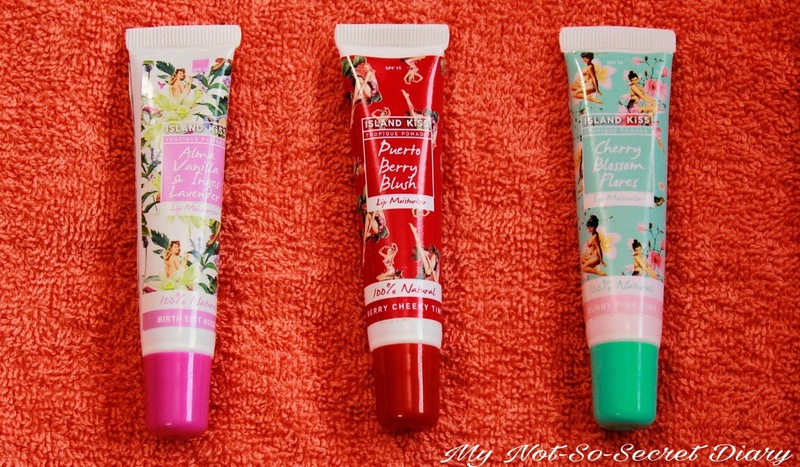 I really love these lip balms but they are not for me. Still, I'll be using the Puerto Berry Blush whenever I feel my lips are not that dry. So, I hope you found it useful. For more about the products, you should definitely check out their website, click here.